Now that we've had a day to digest the two crests up for a vote, I'd like to weigh in on Rafael Esquer's marvelous designs. There is much to like here. 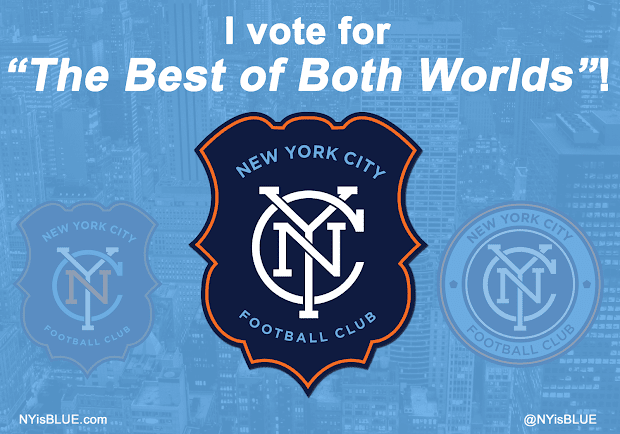 They're both uniquely New York, which ought to quell the "Man City Junior" calls for a few days. They will both stand out amongst MLS logos, and they will both look good embroidered on the shirts. The shield is the result of extensive research into global soccer. Seeking to give the Club a unique and distinctive character within MLS, we examined badges from every professional soccer team in the world. In the end, we found the answer right here at home. This design features the historic shield of the official Seal of New York City – a mark that signifies the pioneering spirit of the early settlers, which in the modern era, has fueled America’s undoubted move onto the world soccer stage. I love the idea of incorporating the shield shape from the city's seal (which is itself featured on the city flag). But there are a few elements that doen't work for me with this particular version, primarily the multicolored monogram. It scatters focus by separating each individual element within the design, when your eye should be drawn to the totality. The shield design features a color not found on the circle - gold. I think that's one color too many. Orange works well as an accent color to highlight the two blues, and the gold is similar enough to, yet different enough from, the orange to make the overall effect muddy. The circular badge is inspired by the old New York City Subway Token, created by the Transit Authority in 1953 and used for 50 years as the standard fare for a ride. 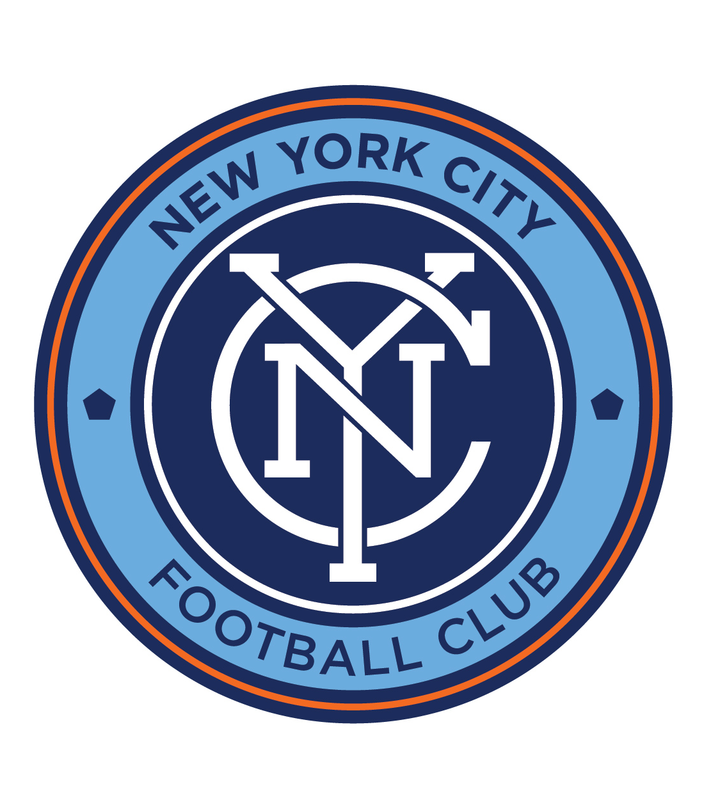 The last version of the token had a cut out pentagon in the center representing the five boroughs, similar to what appears on either side of the monogram, to reinforce the Club’s connection to the entire city. The circle is also a symbol of unity, wholeness and infinity, and is often associated with potential and the number one. 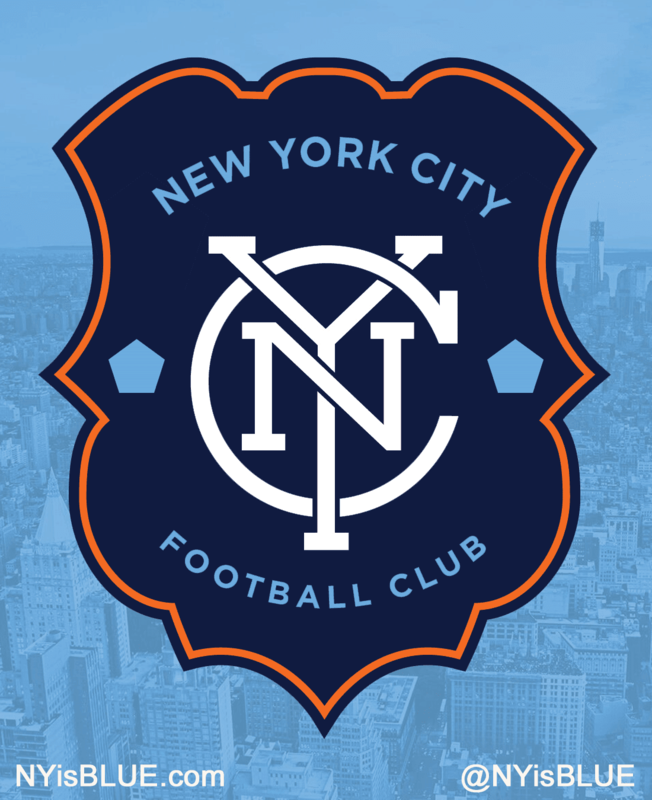 This is a modern and confident badge that clearly speaks to New York City’s status as a leading city. The single-color monogram makes this a clear winner if I have to choose between them. I also love the pentagons. A wonderful symbol for New York; five boroughs, five sides. But again, there are competing elements here that I'd like to simplify. The Gotham text leaves a lot of blank space around the ring, and if there are going to be many outlines I'd rather the white inner outline be orange to match the outer. What if we could take the best of both worlds? The uniquely-shaped badge of the shield overlaid with the single-color monogram? I'd then make the inline orange, to highlight that accent color. 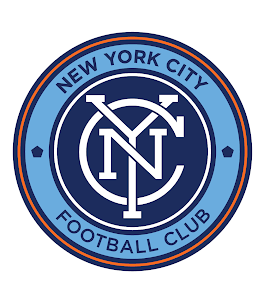 That gives us a predominantly navy shield, which will set off nicely against a sky blue shirt, should they go that route. White monogram, sky blue text, orange inline. This is what I'd like to see, based on the choices before us. I also have a version with blue pentagons flanking the "NYC" monogram on either side, the five-sided geometric shape representing the five boroughs of New York City. They also give us an opportunity to inject a little more sky blue into the crest, balancing out the orange. 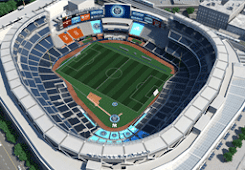 I'm told that the pentagons could make applications such as embroidery more difficult, and that including them here would make getting NYCFC to consider this design more complicated. And that may be. Still, I like them enough to include them here. I leave it up to the reader to judge their merits. Is it possible that we could see a combined design like this? Absolutely. There would be nothing wrong with the club saying "We have listened to our fans, and they like elements of both designs." It would be perfectly in line with the spirit of the vote. Portland Timbers fans were able to get changes made to their crest after it was unveiled; surely we can suggest changes to ours before it has even been selected. But time is short. The vote ends on Thursday, with the final product being unveiled one week later. Let's see if we can get the club to make that final product the best it can be! So send it to the team and see what happens. I think they may agree with you. I think Stephen Stills would be upset about being left out of the Crosby Nash and Young logo. No one is disturbed about the size of the letters? This Y is just too dominant. The NY in the Yankees and Mets insignia are the same size. Same with LA, SF, SD, KC, etc. Take a tall, narrow Y and interlock it with a wide, short N (same dimensions, just at 90°) Wrap the C around it. I whipped up this alternate "Best of Both Worlds" version yesterday: http://www.coinflipper.org/~jpnance/nycfc.png . Kathryn, I hear what you're saying. For the purposes of this conversation, though, I thought that we should stick with the basics of the design. Much easier to ask the club to tweak elements of their own proposal than to re-design major elements of it. Especially if, as I suspect, the Yankees were behind the monogram looking so dissimilar to theirs. Nice, Patrick. I'm not really a fan of the multicolored monogram, but that's a big improvement. Yeah, a buddy of mine felt the same way. I think I just really want orange to be an element of the crest and didn't really like the way it looked as a circle outline. I also instantly fell in love with the pentagons and wanted to keep them around. I actually love the reserved amount of sky blue on your badge design, as if to reference the Manchester City affiliation but still make it clear, through the navy, white, and orange, that this is a New York club. The 'C' in the interlocking NYC logo is a stroke of genius in this regard, making sure to reference both "The City" and "City". 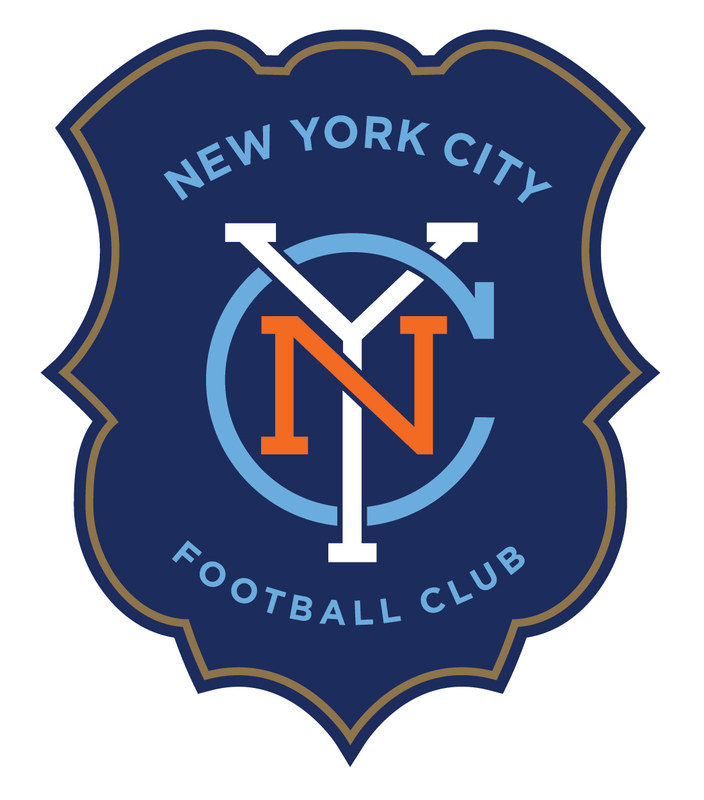 I imagine you've seen this but I couldn't find any mention of it in my minute or two of searching your site: http://mwillis.com/post/51246200889/identity-sketches-for-nyc-fc-colors-logos-branding .